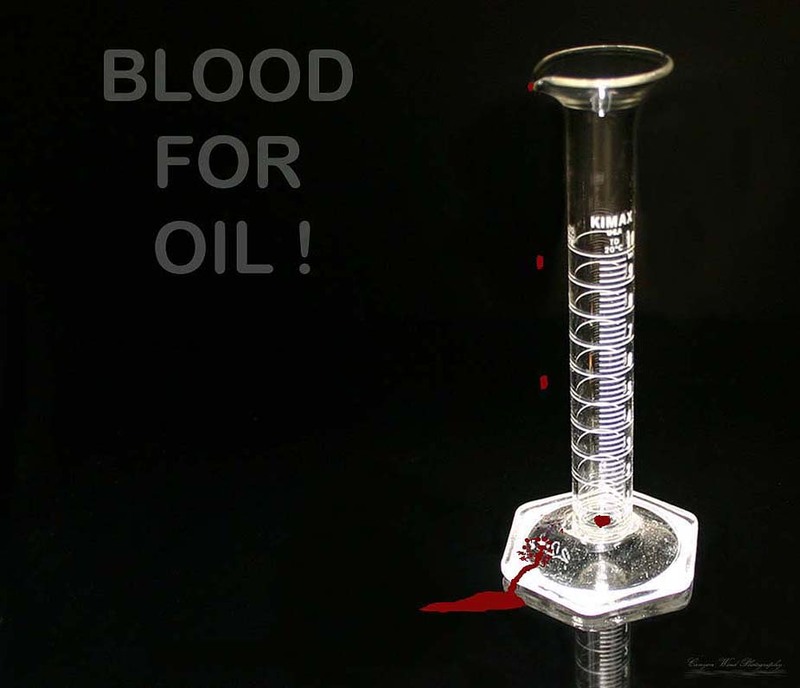 Фото "BLOOD FOR OIL !" You don't have to agree with this . But it's time that the oil compamy's stopped using our troops and other countries for their own purposes . They have the money to hire outside CONTRACTORS . Why then are our troops doing so much for so little pay . If the oil companys want them to fight their battles , then start their base pay at $100,000.00 a year. I back our troops but not the policy of litterally renting them out. It's time to stop the bloodshed for the sake of profit. It's time to stop and hear the baby's cry , the innocent people of the world cry out. The blood of past wars cry out. And what do they cry out ? " ENOUGH ".Think about it when you fill up . IT'S BLOOD . One drop on the ground. Who's is it ? Enough said ! I am ready for the flack now . Вы не можете не согласиться с этим. But it's time that the oil compamy's stopped using our troops and other countries for their own purposes . Но пришло время, что нефть compamy в конец, используя наши войска, и другими странами для достижения своих собственных целей. They have the money to hire outside CONTRACTORS . Они имеют деньги, чтобы нанять за КОНТРАКТУ. Why then are our troops doing so much for so little pay . Почему же тогда наши войска делают так много для столь мало платить. If the oil companys want them to fight their battles , then start their base pay at $100,000.00 a year. Если нефтяной компании хотите, чтобы бороться с их сражениях, а затем приступить к их базе платить 100000,00 долл. США в год. I back our troops but not the policy of litterally renting them out. Я назад наши войска, но не политику litterally аренду их. It's time to stop the bloodshed for the sake of profit. Пришло время остановить кровопролитие во имя прибыли. It's time to stop and hear the baby's cry , the innocent people of the world cry out. Пришло время остановиться и выслушать ребенка плакать, то ни в чем не повинных людей мира взывают. The blood of past wars cry out. Кровь прошлых войн взывают. And what do they cry out ? И то, что они взывают? " ENOUGH ".Think about it when you fill up . "ДОСТАТОЧНО". Подумайте об этом, когда вы заполните. IT'S BLOOD . IT'S BLOOD. One drop on the ground. Одно падение на местах. Who's is it ? Кто это? Enough said ! Достаточно сказать об этом! I am ready for the flack now . Я готов для flack сейчас. Yes, I agree, admire and respect your notes. Very emotional image and very correct words in the note! emotional photo and notes, my great respect! Today is a very topical issue! Endorse you! Yes, my friend! I agree with you!